After two hot hours of picking up trash, weed-whacking, and sweeping at a vacant lot in Point Breeze, PowerCorps PHL’s Desmon Richardson, on hand with fellow crew members to bring some added muscle to the effort, suggested lining the small, triangular space with unused rocks from a pile sitting in the middle of the site. Neighbors who’d been helping agreed: the natural-looking border was the perfect finishing touch for the renewed lot, concluding a sticky Saturday morning spent cleaning up the local eyesore. Members of the Philadelphia Water Department’s Public Engagement team joined the local non-profit Diversified Community Services and area block captains on June 10 to clean the publicly-owned lot at Point Breeze Avenue and Mifflin Street—the future home of a rain garden that will soak up stormwater and bring regular maintenance to the site through Philadelphia’s Green City, Clean Waters program. Similar efforts in other neighborhoods have led to dramatic improvements at formerly nuisance-plagued lots, something locals are hoping to repeat here. Mayor Michael Nutter speaks at the ribbon cutting for Ralph Brooks Park in August. 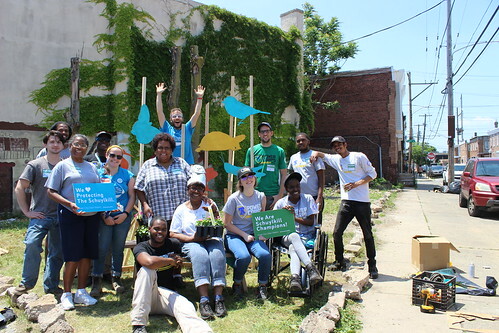 Philadelphia Water will join Nutter for one last celebration of green infrastructure and community collaboration on Monday, December 28. Credit: Philadelphia Water. We’re joining Parks and Recreation and closing out 2015 with a ground breaking celebration for a big, very cool project: the revamp of Smith Playground at 24th and Jackson streets in South Philadelphia. As the second playground project chosen by Urban Roots and the Make the World Better foundation, Smith Playground will get a full, $2.5 million makeover in the coming months. It follows in the footsteps of the popular Ralph Brooks Park project, where a similar collaboration led to a full renovation that wrapped up this summer. At long last, the next Philadelphia Water Spokesdog will be crowned this weekend in Fishtown as up to 20 top dogs—selected by an impressive 4,100 online votes this fall—compete in a pageant to prove which pooch has the best chops for fighting pet waste pollution on our streets. You’re invited! Come out to Grays Ferry to learn about an upcoming construction project at Lanier Playground. Located at 29th and Tasker streets, Lanier Playground has been selected by Philadelphia Water for a stormwater management project that will soak up stormwater runoff and restore the baseball field. Please join us Thursday, Sept. 10 (rain or shine) from 6– 7 p.m. at the Universal Audenried High School Auditorium (3301 Tasker Street) to learn more about the project and what you can expect during construction. Refreshments will be served. This project is part of Philadelphia’s Green City, Clean Waters program which works to improve the health of our local rivers. By storing rain water under the park and then letting it soak into the ground through natural processes, we can help keep the Schuylkill River clean. Philadelphia Water’s construction work will start before the overall Lanier Playground Improvement Project planned by Parks and Recreation, the Trust for Public Land, Philadelphia Water, Councilman Kenyatta Johnson’s Office and the community. 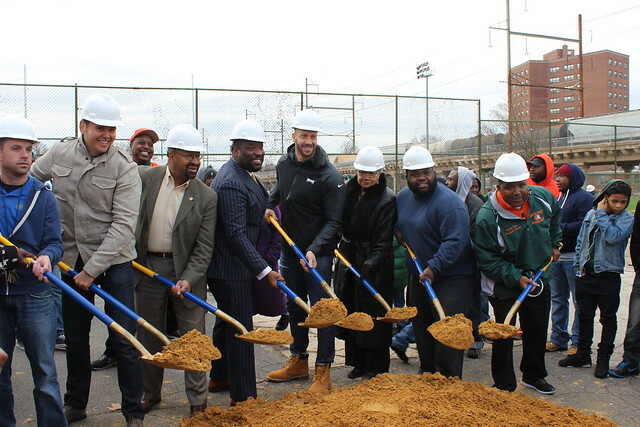 Top: City Councilman Kenyatta Johnson, Mayor Michael Nutter, Philadelphia Water Commissioner Howard Neukrug, Connor Barwin of the Philadelphia Eagles and others cut the ribbon to open Ralph Brooks Park in Point Breeze. Bottom: A new rain garden stretches along the basketball courts, which sit atop a storage trench that holds stormwater. The rain garden will be filled with plants next month. Credit: Philadelphia Water. After three years of fundraising, planning, design, and construction, the Point Breeze community officially welcomed a tremendously improved Ralph Brooks Park at a ribbon cutting ceremony on Monday. The project was made possible through the collaboration of several city and state agencies, Pa. State Representative Jordan Harris, City Councilman Kenyatta Johnson, the non-profit groups Urban Roots, Mural Arts, PHS, Philly Rising, 25th Century Foundation, Tasker Street Baptist Church and the Make the World Better Foundation (MTWB), founded by Philadelphia Eagles player Connor Barwin. That broad coalition allowed for a complete renovation of this public space, with improvements covering everything from new playground equipment and basketball courts to a community garden and green stormwater features that add to Philadelphia Water’s Green City, Clean Waters infrastructure. The stormwater features include a rain garden at the southern end of the park, and an underground storage trench beneath the basketball courts along the western edge of the park. Combined, those green tools can manage over 16,000 gallons of stormwater—it would take 320 homes with rain barrels to store that much stormwater runoff—and the trees, shrubs and other plants add to the beauty of Ralph Brooks Park. While the ribbon cutting featured plants donated by Bartram’s Garden, the actual vegetation for the site will be planted in October, which will give the plants a better chance to become established and thrive. “This partnership demonstrates that green infrastructure projects can manage stormwater and enhance community efforts to improve and beautify public spaces,” Philadelphia Water Commissioner Howard Neukrug said of the project. Other speakers at the event included Mayor Nutter and Barwin, who raised $170,000 for the project through a benefit concert. Philadelphia Water contributed approximately $152,000 to the project. The Ralph Brooks renovations are part of Green City, Clean Waters’ Green Parks program, which works with Philadelphia Parks and Recreation to leverage resources for park improvements and bring green stormwater tools to park sites. Philadelphia Water is also working with partners from the Ralph Brooks project to bring similar improvements to Smith Playground in the West Passyunk neighborhood. Green infrastructure improvements at Smith are scheduled to begin construction next summer.